If you organize your closet and coordinate your outfits ahead of time, it will help you to get out of your house more quickly. It’s a process that you can do ahead of time to help make your life easier and be able to attend more functions. This eliminates self-doubt, worry, and withdrawal at events, and instead, you can network, socialize, and feel easy because you haven’t fried your brain trying to get dressed! This activity can be beneficial for those with ADD as well as everyone else. Step 1: Look for pictures in magazines and catalogs of outfits and “looks” that you would like to be able to achieve easily. Pull these pieces from your closet, and identify entire outfits rather than separate pieces. 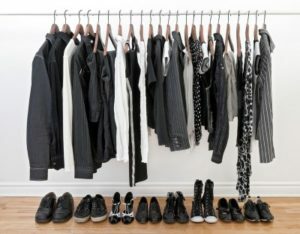 Most ADD people have closets full of separates, but these tend not to go with anything else, or it’s difficult to determine what goes with what. Find looks for all occasions (i.e. sporty, weekend socializing, vacation, work, business, casual, travel, eveningwear, etc.). This is planning on a large-scale basis; if we are organized with regard to clothing we never have to think twice about what goes with what. Total outfits will be put together ahead of time; the whole outfit always gets worn together, laundered together, and put back in the closet together! Step 2: Head to your closet; look at the outfits you’ve found, and identify the items you might already have in your closet. Step 3: Go shopping for the missing piece(s). When you walk into a clothing shop, have a list of the items you need in hand. You’ll be able to pick up that scarf that’s the right color and weight to finish off one outfit and a pair of black trousers for another. Step 4: Start with five outfits. Then go to create another five, and another five, etc. Step 5: What about those “security blanket” pieces of clothing? Those that you cannot or will not give up. Store those at the back of your closet away from your outfit sets. You’ll still have those, but they won’t interfere with the organization you are trying to achieve. Step 6: Now, we’re going to take everything out of the closet. Put your clothes on the bed or somewhere you can start to categorize and sort. Make sure you have the right kind of hangers – those you can hang both a blouse and pants on. Get enough of one kind that are the same size, thickness, etc. Step 7: Don’t forget to occasionally count up how many total looks you’ve accomplished to give yourself a boost. Step 8: If you need to, take a break to reorganize. Straighten out what is left on the bed. Put your hangers in a pile, and count your total full outfits. Review your list of potential purchases and decide when you’ll go on your shopping trip.